Choosing a console is a sometimes difficult task. Most people tend to go for the PS4 or XBOX One, they are the biggest boys in the playground at the moment after all. While various stats about the XBOX One and PS4 usually get bandied about, the controllers are usually ignored. A big part of your gaming is how comfortable you are playing. If your controller doesn’t feel right in your hands, you won’t be able to enjoy the game properly or achieve your best performance. So how will you know which controller is best? The DualShock 4 is the latest version of the controller Sony have been working on for over 20 years. Starting with the original PS1 controller, they have made slight alterations to each iteration. Each time a new version came out they have slowly inched towards the DualShock 4 that is currently in use. The controller has grown slightly over the years, especially from the original controller that didn’t even have analogue sticks. The DualShock 4 is the largest version of the controller, but it has made up for the bulked up size with improved ergonomics. It’s not just the ergonomics that have had a shot in the arm though, the functionality across the board has been ramped up. Which areas have seen the most improvement? You’ll find that out later on. The evolution of the XBOX controllers have taken a different tack to the PlayStation. 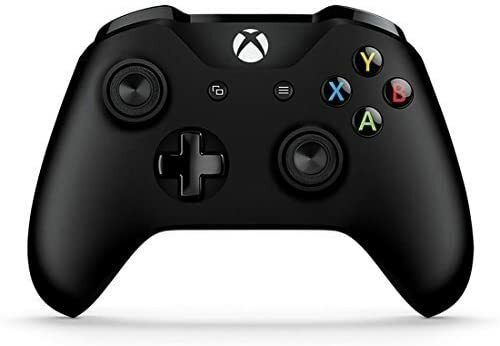 The XBOX controllers have noticeably shrunk down over the years after starting out almost as big as the console itself, they are now universally hailed as one of the best controllers around. The XBOX One controllers have undergone some improvements since previous iterations as well though. The responsiveness of the controller has been drastically improved and it has just been tidied up from a design perspective. Which pad is the superior item though? Let’s get to the important part. The head to head comparison to decide which controller is best for you. Some sections will declare an outright winner. Some will show which controller is most likely to appeal to your tastes. With that being said, let’s find out which is the controller for you! The size and weight of a controller is an objective parameter. Some people prefer a smaller, lighter controller and some people prefer a big, heavy controller. Neither one is right or wrong, it is just down to what you prefer. It is important to remember that when it comes to size, too big can often put people off. Some of the most derided controllers in history were far too big. The original XBOX and the Atari Jaguar are just two examples of when a huge pad goes wrong. When it comes to size, the DualShock 4 is the slightly bigger controller. With the DualShock 4 coming in at just over 900 cm3 and the XBOX One S controller coming in at just over 600 cm3. While the DualShock 4 is a third bigger than the XBOX One S controller, the DualShock does have the two handles that protrude from it which artificially inflates its overall size. 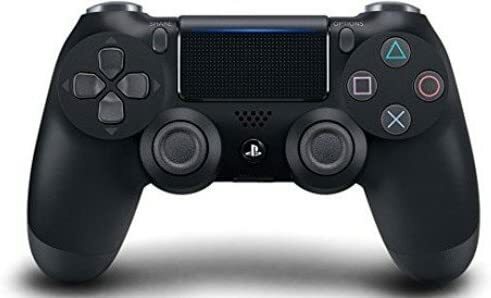 The DualShock 4 not having its middle filled means that while its dimensions may point to it being a larger controller, when you hold it in your hands it does feel smaller. The two handles and lack of filled middle explains why the XBOX One controller is the heavier of the two. The DualShock 4 weighs in at 210 grams and the XBOX One S controller is 280 grams. Overall if you prefer a larger, heavier controller then the XBOX One S is for you. If you prefer a smaller, lighter controller then the DualShock 4 should be your weapon of choice. Ergonomically both controllers are absolutely superb. The DualShock 4 and XBOX One S controllers both fit easily into your hands. 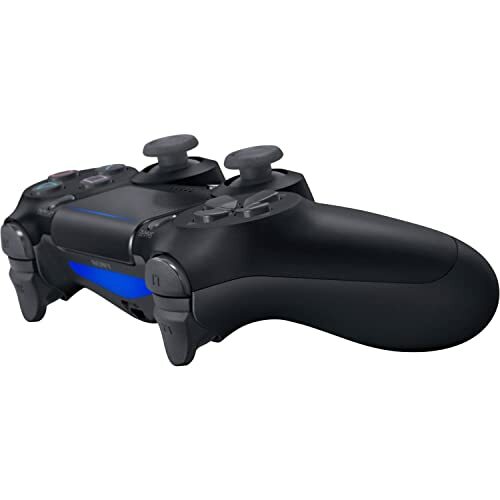 The handles on the DualShock 4 combined with the parallel analogue sticks means that it fits into the hands superbly and your thumbs will line up with the analogue sticks with ease. The D-Pad and buttons are easy to reach from your thumbs home on the analogue sticks and the triggers are easily accessible with your fingers on the back of the controller. Overall, after using the DualShock 4 for a short amount of time, you will not have any issues finding the buttons. What about the XBOX One S though? Well even though the analogue sticks aren’t parallel like the DualShock 4, it still fits into your hands easily. You can reach everything with ease from the default holding position and the triggers are easily accessible with your fingers. The only real difference between the two controllers is that the analogue sticks on the XBOX One S controller have a more grippy surface. This means that in terms of ergonomics, the XBOX One S is the marginal winner the only real difference being the grip on the analogue sticks. Who will win the next round? Keep reading to find out. While the analogue sticks on the XBOX One S do ensure that the player is able to keep their thumbs in place more easily, the DualShock 4 does offer a greater degree of accuracy when playing games. This is because the sticks themselves offer more resistance. This allows for the player to control the movements of the analogue sticks a lot more easily. Why is this? Due to the sticks pushing back slightly it means that you won’t accidentally slide too far when trying to aim with precision. While the XBOX One S analogue sticks do also have some resistance, they don’t have it to the same degree as the DualShock 4 controllers. That means in term of usability the DualShock 4 comes out marginally on top. The D-Pad on the two controllers is the first time that there is clear daylight between the two controllers. The XBOX One S D-Pads don’t offer anywhere near the quality of the DualShock 4 controllers. The D-Pad doesn’t offer smooth transition between positions and the D-Pad itself suffers from far too much resistance. All of this is added to an off putting click every time the D-Pad is pressed. In comparison, the D-Pad on the DualShock 4 can only be described as a dream. The buttons have very little resistance when pressing them down and the transition between positions is as smooth as it could be. It is also larger than the XBOX One D-Pad which makes it much simpler to use. There is no issue with the loud clicking either which just makes the DualShock 4 D-Pad even further ahead of the XBOX One S controller. The shoulder buttons on the two controllers are hard to split, but there is a difference between them. Both controllers have nice large shoulder buttons that are easy to find and are incredibly responsive. They’re easy to find for either controller and the only real difference between the two is that the XBOX One S controller has slightly larger shoulder buttons. The triggers for the two controllers have more of a gap between them in terms of quality, in fact there is a clear winner for this one. Which controller offers the superior trigger? First the qualities that each one possesses. The DualShock 4 has excellent triggers. They allow for the fingers to easily find them, they have the perfect amount of resistance and they are a good size that means missing them is a rare occurrence. All of that leads to the inevitable winner for the DualShock 4 triggers right? Wrong. The XBOX One S manages to offer everything that the DualShock 4 does with it triggers and more. They are just as ergonomic, meaning that they are comfortable and easy to find in the midst of gameplay. They are larger than the DualShock 4 offerings and offer haptic feedback too. This means that there is a slight amount of force feedback from the triggers depending on the in game situation. This adds up to the XBOX One S triggers offering more than the DualShock 4 ones. This by no means makes the DualShock 4 triggers bad, it just means that the XBOX One S controller has superior triggers. Overall the DualShock 4 and XBOX One S are both very even controllers in terms of usability. The DualShock 4 edges it out slightly with the superior analogue sticks and D-Pad offering more than the XBOX One S controllers slightly superior shoulder buttons and triggers. That means that the DualShock 4 has narrowly won out when it comes to usability. The final round will help to finally separate the two warring controllers. Which one will win out? Keep reading to find out. Both controllers allow for the use of earbuds, headphones or headsets. This is via the headphone jack that both controllers possess. It makes for a simple process to be able to move around the room with ease and take the sound with you. Bluetooth compatibility is also a feature that both controllers possess. The XBOX One S has the slightly superior bluetooth support due to the DualShock 4 requiring the official Sony bluetooth dongle where as the XBOX One S controller can do it with any adapter. Both controllers are also able to be used with your PC for gaming, although the DualShock 4 does require additional drivers in order for it to work on the PC. While the XBOX One S controller does have the advantage of being able to work right away on PC, the DualShock 4 is backwards compatible with the PS3. The XBOX One S controller doesn’t have the same feature for the XBOX 360. The DualShock 4 manages to come into its own after this though with two features that the XBOX One S controller doesn’t have an answer to. Firstly, the DualShock 4 has a gyroscope built into it. This allows for it to have various motion detection features that can be used to control the camera or your aim depending on the game you’re playing. The DualShock 4 also has one other feature that sets it apart from the XBOX One S controller. The touchpad at the top of the controller allows you to use it to control a cursor or even use it to type. It also can be used as an extra two buttons for some games. When it comes to added extras there is a clear winner, the DualShock 4. The winner by the slenderest of margins is the DualShock 4. There isn’t a lot of different between the two controllers, but the DualShock 4 does have slightly better Usability and Added Features. The XBOX One S controller won out in the ergonomics stakes. So, which one should you choose? Despite the DualShock 4 winning out as the superior controller, the choice isn’t quite as easy as you might think. The main thing when choosing a controller does come down to personal preference. If you’re used to an XBOX, then you are more likely to like the XBOX controller. If you’re used to a PlayStation then you’re more likely to like the PlayStation controller. 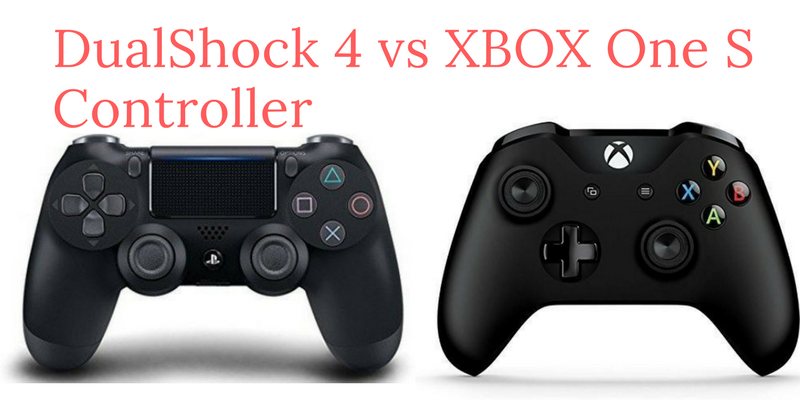 The DualShock 4 might be marginally the better controller, but when it comes to making your own choice then your own personal preference will guide you towards the controller and console that you want. I’ll always prefer the Xbox controllers over the Playstation ones purely because of the sticks. 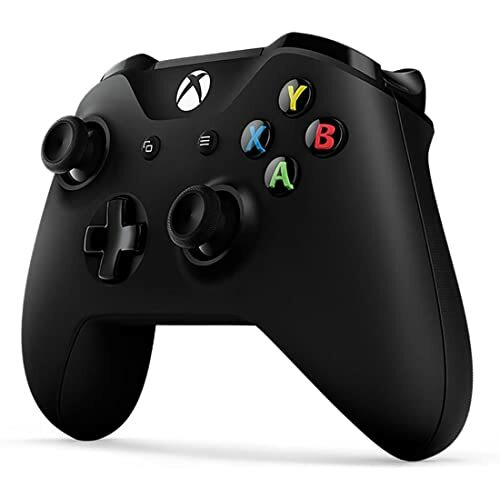 I like the offset placement of the Xbox’s sticks as well as their design – they’re concave on the top which makes it easier to grip them with your thumbs. Playstation did that a little bit with the PS4 sticks as you can see, but they’re still not as good as the Xbox’s sticks. It’s funny too, because I was originally a “Playstation guy”, and also funny because the very first Xbox controller was possibly the worst first party controller ever made. Seriously, who on earth used that thing and thought “yeah, this is good”?! All the play testers they used to test that controller must have had giant hands.